I’m pleased to welcome Sid Mistry, Senior Manager of Demand Generation at Crowd Science, as a guest blogger. Sid has been leading B2B Demand Generation and Marketing Programs for more than eight years. As one of Marketo’s first 50 customers at Right90, he has since implemented Marketo at Selectica and Crowd Science. We are thrilled to welcome him. Once upon a time in marketing automation land, there was a white paper that was orange and needed some juice. But more on that later. Let’s start with the story of Crowd Science and how we crank out new leads and keep them nurtured with the help of Marketo. Crowd Science is creating a stronghold on the audience targeting and measurement space. We launched our new platform called CITRUS last year, and we are rapidly growing our brand recognition and market share. The marketing team, and its budget, are small but effective as we push to increase our footprint and grow our customer base. As with most small companies, one of the biggest marketing challenges we face is content — content is king and producing rock solid material to maximize marketing ROI is paramount. Crowd Science has taken the quality over quantity approach. Our ‘Orange Papers’ (drawing from the theme of our platform, CITRUS) contain helpful information that get our readers thinking in new ways about how they can measure and better monetize their online audiences. Download rates for our papers increased by over 75% compared to a cookie-cutter white paper. Part of this improvement is attributed to the way we use Marketo to distribute our content. In addition to our unique approach in packaging our materials, the marketing team proactively emails relevant contacts within our database via Marketo, and the sales team personally sends out our Orange Papers with Marketo Sales Insight in SalesForce. 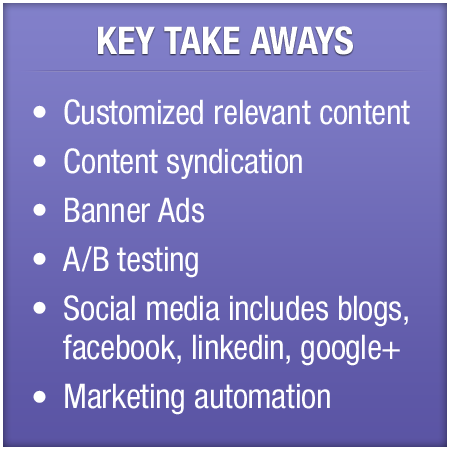 These factors all contribute to the increased marketing ROI. Crowd Science also takes advantage of content syndication to increase lead generation and raise awareness. We co-market with our partners and sponsor banner ads, and we make the most of A-B testing on our landing pages. We’ve seen a 33% increase in conversions from one page over another when promoting our banner ads. Marketo makes this testing easy and allows us to be agile. We also syndicate content internally through our killer social and online presence. When we need to get the word out, we use guerilla (or should I say Orangutan) marketing tactics through all relevant channels: blog posts, SEO optimization, Facebook, LinkedIn and Google+ pages, social bookmarking, Twitter, and email. We have integrated Marketo’s social-sharing features on all of our landing pages as well. All of this allows us to amplify our footprint beyond traditional outbound methods. Crowd Science also maintains an online Resource Library that contains just a few selections of our most valuable content, from webinars and research studies, to our now infamous Orange Papers. By re-purposing our content in this way, we not only build SEO value for our site, but have information readily available for our prospects, customers and partners. 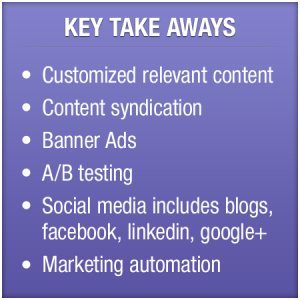 25% of our monthly leads are attributed to this section alone. Sweet! Marketing automation continues to play an integral role for our scrappy but effective team. Our goal this year is to leverage Marketo’s new token and snippet features to customize our content further for our prospects. We want to be broad in our messaging where it makes sense to do so and be laser-focused and foster conversations with our most valuable leads and opportunities. 2012 is the year of orange-a-tang for Crowd Science!